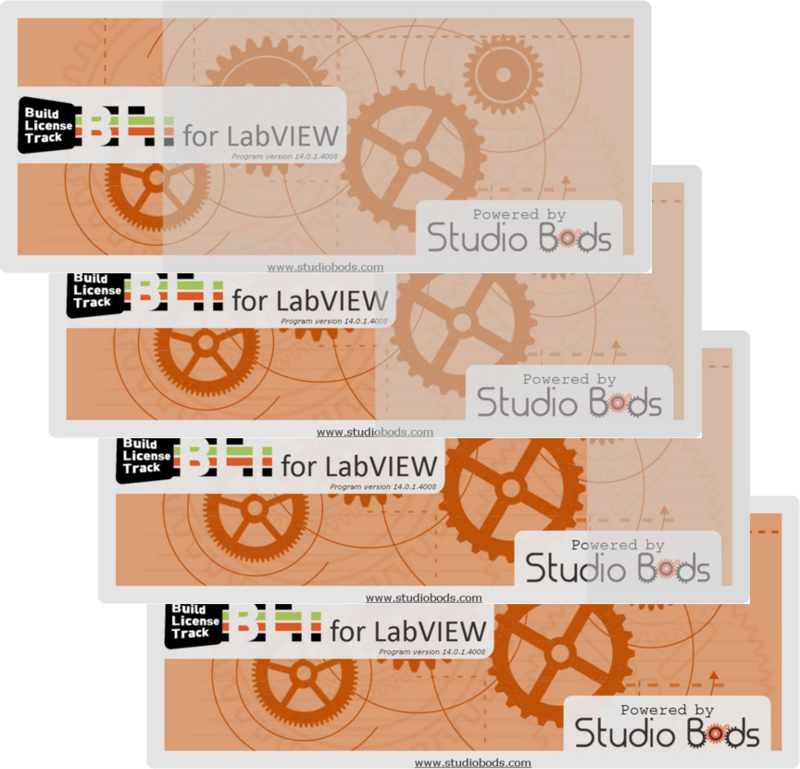 BLT for LabVIEW allows you to customize your product with your company color scheme and splash screen. •The splash screen is displayed while your product is starting and checking the licensing server for authentication. •The windows color scheme applies to any window or pop-up displayed by BLT for LabVIEW (ex: Type your activation key, License invalid, Register Trial License,etc...). - Use JPEG, PNG or BMP picture files as background image for your design. Only one picture can be used per design. - Your picture should not exceed 1MB and 1Mpxl resolution. If its size exceed 80% of the display screen size where it executes, the splash screen picture will be automatically resized to that size, maintaining aspect ratio. If your picture is less than 80% of the display screen size, its size will not be modified. Bigger your background picture is, longer it takes to display and process the splash screen on the end-user's computer! (You can also double-click on the product name in the tree). •Double-click on your product in the tree to display the Product configuration page. •Select the Splash screen tab. Here you can create different splash screen and windows color scheme configurations. •Use the buttons on the right to manage your configurations. •Select a splash screen name in the list and click Select Splash screen to apply the configuration to your product. 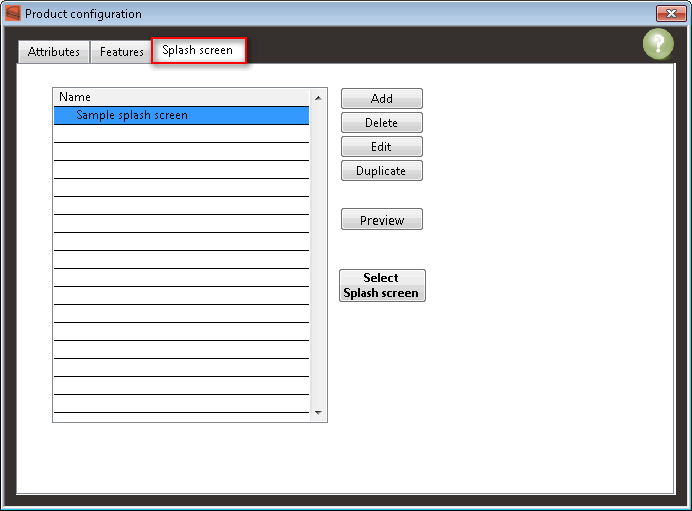 •Click on Add or Edit to display the splash screen and windows color scheme configuration page. oName: Enter a name for your SplashScreen configuration. oChoose Picture: Click this button to select the background picture for your splash screen. See here for considerations when choosing your picture. oProgress Bar: Settings for displaying a progress bar with your splash screen, while your product is loading. ■Visible: Enable or Disable the progress bar display. ■Position: Choose whether you want the progress bar to be displayed above (Top) or below (Bottom) your picture. The progress par cannot be displayed in front of the background picture. ■Size: Define the size in percentage of the picture size for the progress bar. The progress bar will be automatically centered with your picture. ■Spacing: Specify the distance (in pixels) between your picture and the progress bar. Empty space will be transparent. ■Fill Color: Define the foreground color of the progress bar. ■Housing Color: Define the background color of the progress bar. ■Text Status Visible: Specify whether you want or not to display Status Information text on the progress bar while your product is loading. ■Text Status Color: Define the color of the Text Status. This color should allow good readability in front of both Progress Bar Fill Color and Housing Color. oTransparent Progress on picture: If enabled, an transparency mask is added to your splash screen while your product is loading. At 0% loading, the transparency mask is applied on all the picture. At 50% loading, the transparency mask is applied to the half right part of the picture. At 100% loading, the transparency mask is not applied anymore. This loading effect can slow the loading of your application if your background picture is too big! 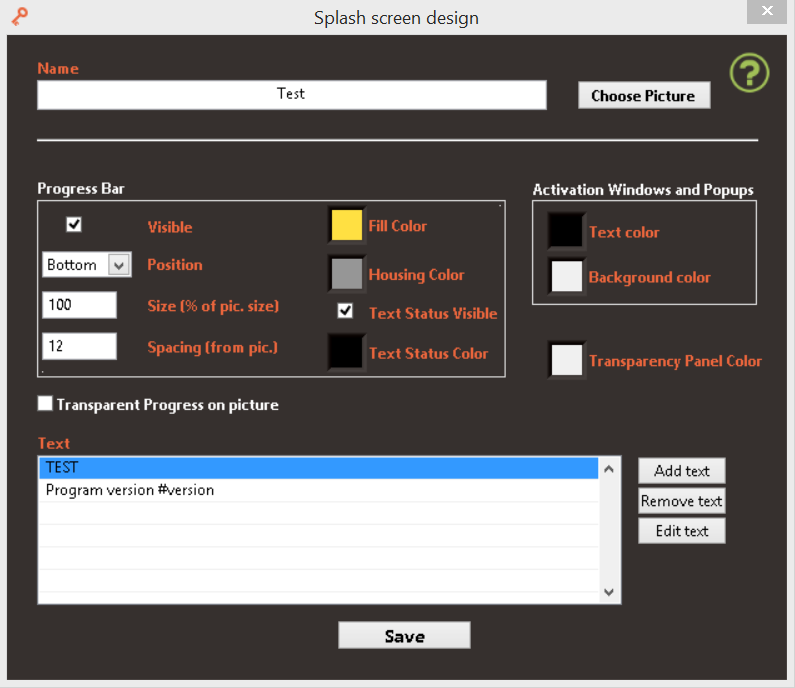 oTransparency Panel Color: Define the color of the splash screen window front panel. This color will be replaced with transparency at run time, allowing better rendering of your splash screen. You should set a color that is not present neither in your background picture or Text overlay elements. When "Transparent Progress on picture" is enabled, the transparency mask applied display the Transparency Panel Color in background. oText: Use this section to add text elements in front of your splash screen picture. You can add as many text overlay elements as you want. Click "Save" to validate your configuration and sent it to the Licensing Server.